The ancient history of the Hendersons is tied to that of Caithness, the land that they settled as their home. Caithness itself is not native to the British Isles geologically, but rather is a piece of the North American continent that plate tectonics has grafted onto Scotland many millions of years ago. It’s geology is distinct and separate from the land south of the Great Glen, and this unique geology is responsible for the rich deposits of oil and shale that are the life blood of the North Sea economy. But before the norse Vikings came to this Caithness, it was inhabited by Picts and later Gales. There is a great deal of evidence that Caithness has been people for at least the last 4,000 years. This comes in the form of dozens of Brochs scattered across the coast. 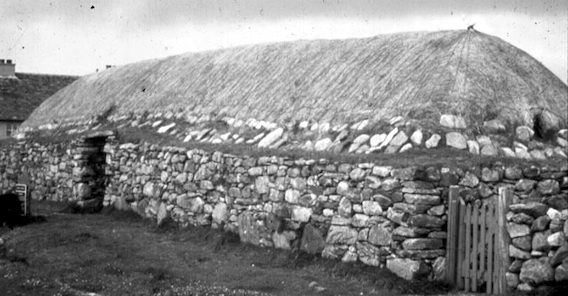 A Broch is an Iron Age drystone hollow-walled structure of a type found in Scotland. 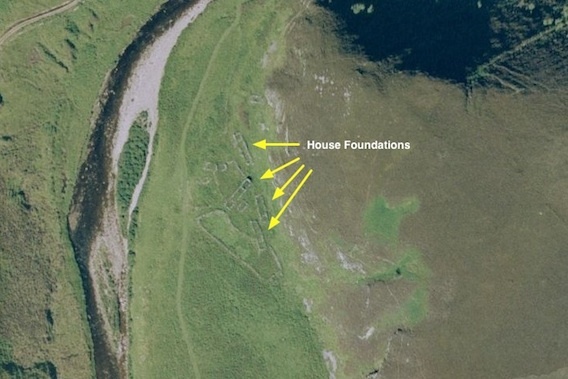 Brochs include some of the most sophisticated examples of drystone architecture ever created, and belong to the classification “complex Atlantic Roundhouse” devised by Scottish archaeologists in the 1980s. In old Norse they are called “Borg”, a name which appears in southern Caithness. These Brochs were built during the Bronze and Iron ages, between 1,000 BC and 400 AD, most likely by the native Picts and Gaels who lived there at the time. Their purpose and use is still the subject of little agreement among archaeologists, but they likely served the same purpose as later day castles; a fortification that provided defense in times of war, and a symbol of lordship and power in times of peace. Sometime during the 8th century AD, the Norse began to colonize northern Scotland and Caithness, under claim from the Norwegian Earldom of Orkney. Picts came to Orkney during the Bronze Age and archaeological data shows that there were people living there prior to the Vikings who came to Orkney, probably by the latter part of the 8th century although this is up for dispute. Norwegian Vikings probably either came to the islands first as farmers who were seeking land or as warriors who were claiming territory and riches as was common with Viking conquests elsewhere. Though it is controversial, there is evidence emerging that the Norse occupation of Caithness was not a violent or tyrannical rule. Much of this evidence is coming in relation to research being performed by George and Nan Bethune, and work done via the Dunbeath Heritage Centre. The emerging picture is of Dunbeath as a town that straddled the Gaelic people of the south of Caithness and the Norse people to the north, where these two groups of people met to trade, worship and interact. Emerging science is describing a history for Dunbeath that goes back to the earliest periods of our recorded history – a tale that deserves much deeper study. Thanks to the dedication and hard work of a Henderson cousin, we have at long last found our ancestor’s photos. This one is a portrait of him in 1909, the year that he died. By this point his health had become frail, and he was retired from full time duties as the minister of the Busby Free Church. Words cannot describe the gratitude I feel towards my cousin for finding this, and taking the time to pass this on. Some days when you are researching history, you get lucky. 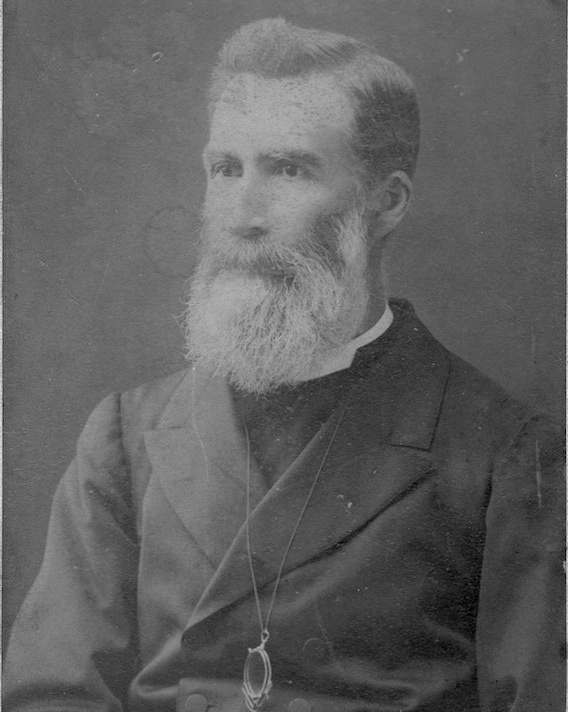 Early in our research efforts it became clear that it was very likely that photos of Reverend Adam had been taken at some point during his life, and that there was a reasonable chance that his family was photographed as well. The question would be – had any survived to the present age. Then, as luck would have it, a cousin and member of the research team found an old photo, in a place where you would not normally keep a photo, such as at the bottom of a dresser drawer. There, preseved for us to find more than a century after it was taken, is the photo we all hoped existed. 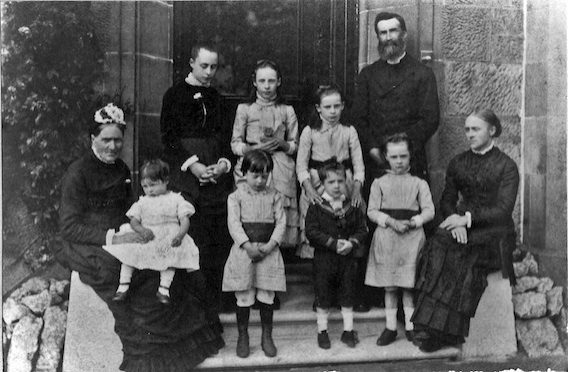 It appears to be Reverend Adam C. Henderson, his wife Jane, and the lady at the far end being named Connie Cunningham – possibly a cousin of Adam, along with their children Hughina, Annie, Jane, Baby Isabella, Mary, Donald and Dora. No hint of where James (my grandfather) is during this shot, though maybe he is behind the camera. We are still trying to figure out where this photo was taken, thought it seems like it could be a church doorway, it does not match the photos we have of the Busby Free Church. I cannot thank my cousin Sheri enough, this is truly a treasure. [Update 07 Feb 2010] – A special thanks to Kathryn Campbell for giving us a possible location: The graveyard house at Cathcart cemetery. This is a continuation the story of our joint research to find the history of the Reverend Adam C. Henderson. You can read the first part in Finding Adam – Part One. In the first part of this story, our research went from a few names and a handful of dates into a the outline of a history about my great-grandfather, the Reverend Adam C. Henderson, who was born in Ramscraigs and escaped his humble origins to attended the University of Glasgow, and become a pillar of the Busby and East Kilbride community. Though we were incredibly fortunate to find not only his university records, but what we think is a photograph of Adam at divinity school, there were still so many gaps in his life we hoped to fill. As is the case for many parts of the UK, the area around Busby (near Glasgow) and East Kilbride enjoys a group of local scholars who work to discover, document and preserve the local history. For the area where Adam was minister, the Giffnock Library is the hub of the Busby Historical Society. The Giffnock holds a significant and growing collection of documents, recordings and photographs of Busby and East kilbride. We contacted them in 2007, and they were happy to help us locate what information they had, which led us to be in contact with John McVicar by mid 2008, who was compiling a book on the history of Busby. Thanks to the McVicar’s work, we were able to learn a great deal about Adam’s community; the places, events and environment in which he lived, along with the organizations and associations that he belonged to. Sadly they had no additional photographs of the reverend and his family, but the information they had about his activities was welcome additional detail about a man we knew little about. Though we were adding to our knowledge, it was a nagging problem that we could not locate Adam’s grave. For a man who had played a prominent role in the communities of Busby and East Kilbride, the lack of evidence of his life remained an enduring mystery. In an attempt to tear through the fog of time, we resolved to locate, by brute force searching if necessary, Adam’s grave and the final disposition of his children and their descendants (if any). By consulting Scotland’s People, we began locating and downloading images for the birth, marriage and death records for every one of Adam’s children. In the process of doing this, we found that sadly there were two babies born to that family that did not survive for long. We were surprised to find that a surprisingly low number of his children actually married, and that for a large family of that size there were very few grandchildren. Most of our searches forward towards the present day dead ended, leaving us with the impression that Adam’s line was not nearly as robust as one might think. Worse yet, the older members of the family we contacted remembered conflicting information, some of which eventually turned out to be wrong. It was our sincere hope that we could contact some of his descendants in hope that they might be able to help us fill the family history. As luck would have it, we were eventually sift through immigration, birth and marriage record to determine that two of Adam’s younger children had married and immigrated to Ontario. They died in the 1970s, and were buried in Hamilton, Ontario. Thanks once again to the magic of the internet, I was able to enlist the aid of the local library to uncover the obituaries for them and their wives, which named several of the descendants. Armed with these names, we worked to find a recent postal address, and then sent a series of introductory letters, asking if they would be willing to re-connect with the family and help us in our research as best they can. Fortunately for us, our relatives seem to be uniformly kind and generous, and we soon incorporated two new cousins into the project. Sadly for us, they were, like us, without much useful information. This lack of passed down history and relics seems to have been universal, and point to some rift in the past that at present we cannot identify. Throughout 2008, we searched cemeteries across the Glasgow, Busby and Rutherford area, including walking through looking at headstones. Clearly the brute force method was not yielding results. It could have been that his grave was unmarked, or that weathering had removed any inscription we could read. Early in 2009, I decided to begin “socially engineering” government records keepers in central Scotland to help find his grave. Late in January we got lucky, and we were able to locate his grave in Cathcart Cemetery, Section F, Lair 471, along with his mother, his wife, his mother in law, and two babies that died within the first year, Donald and John. 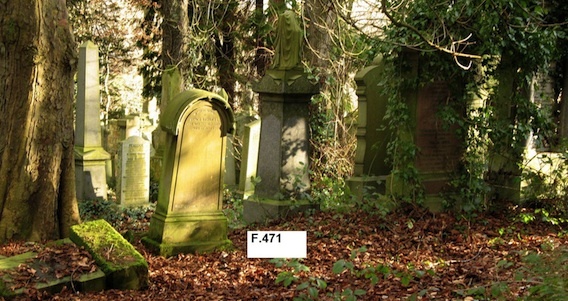 Photographs show that the grave is either unmarked, or the headstone is lying face down in the dirt. 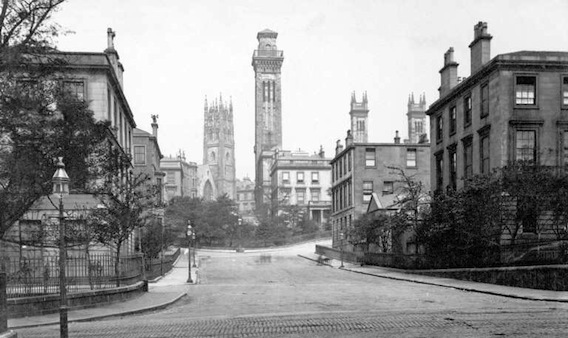 Many questions remained, one of the biggest was how could a clever boy from a humble background afford the costly tuition at the University of Glasgow, let alone the cost of living in Glasgow in the 1860s while attending school. We had uncovered as much as we could find in Lanarkshire as we could think to look for, the next step in finding Adam was to visit Caithness, and see what could be found. Section of the church minutes from the Busby Free Church. Traveling to Caithness is not trivial, as the best way to reach it is a long drive up the treacherous A9 motor-way north from Inverness. We had contacted the Dunbeath Heritage Centre, and the staff encouraged me to visit to research my family. Words are insufficient to describe the level of emotion as I crested the Ord of Caithness near that ruins of Badbea, and descended the Berriedale Braes. There, perched high above the hairpin turns was the old Berriedale graveyard, where I knew Adam’s father and brother were buried. The hillsides were dotted with ruined and abandoned stone houses, one of which I knew had to have been Donald’s house, where Adam was born and raised. To me, this was a land of legend – yet at the same time only separated from any of us by the will to go there and see it for ourselves. The Dunbeath Centre was more than I could have hoped for, and the staff were incredibly helpful. Not only did they know of the family, but they had taken the time to catalog and record the family tree on a very long chart, which they generously copied for me to take home. They also identified where to find the graves of many of my Henderson ancestors and kin. The remainder of the trip focused on photographing the area, many of which are now part of this site. Though we have made tremendous progress from that first search, there is much that we are looking for but may never find. The mystery remains of why so little was passed down from Adam’s family to the present day, and what became of photos, letters or other things from that day. One fact brought to light from our research regards Adam’s mother, Ann Cunningham Henderson. When Donald died in 1892, Ann moved to south to Lanarkshire and lived with Adam and his family for the rest of her years. By working with Sally, it has become clear that people in Caithness were very enthusiastic about having their photos taken. In fact there were several places, including Wick and Thurso, where there were portrait studios. In addition these photographers would sell a portrait sitting during “Market Days” which would happen twice a year (spring and fall) in Dunbeath. Therefore it is possible that photographs of Donald and Ann were taken when they were quite old. The question comes up then, what happened to them and could they have survived the present age? (more on this in a bit). Ann passed away in 1900, 9 years before Adam’s death and 21 years before Jane’s death. From what I have been able to gather chatting with some folk historians in Dunbeath, it was the custom (and sorry if this is universal to Scotland) that people of that time would keep a “Kist”, a trunk, box or chest that held “bonnie things”. When Ann moved to Busby to live with Adam, the chances are very high that her Kist (if she had one) would have come with her. Whatever Ann may have taken to Busby would probably represent the pinnacle of what we might be able to recover from a family history standpoint, if any has survived to this day. As a hint that some of what we seek is not so much lost as it is misplaced, a strange photograph came to light in September of 2009. During a visit to my Aunt Moira, she brought out old photo albums and we looked through them. As we were flipping throughout the book, a tiny photograph fell out from behind a larger black and white photograph. In it were four people, sitting in front of what we now know was the reverend’s house on Derby Crescent in Kelvin Grove, Glasgow. One is clearly my grandfather James as a young man. Seated with him is a young lady, whom my Aunt identified as my grandmother, along with an older man and an older woman. 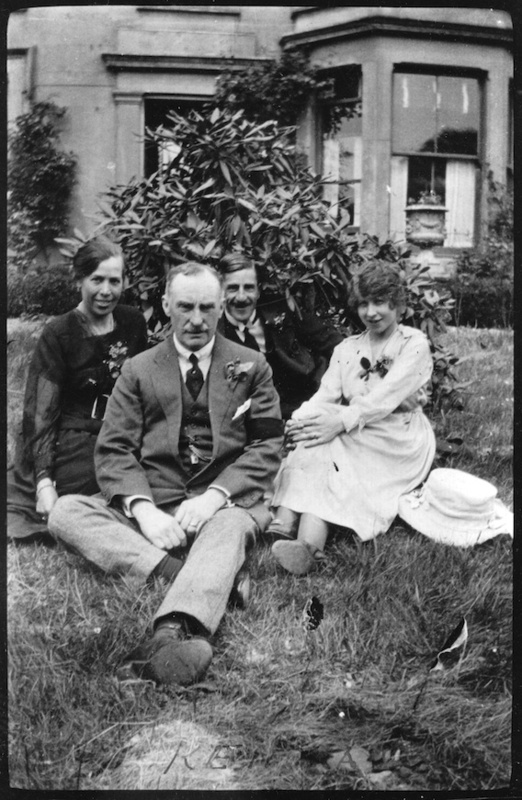 Is this Reverend Adam C. Henderson, his wife Jane and my Grandfather James? We hope to find enough evidence in the future to determine this beyond doubt. The older man bears a significant resemblance to the young fellow from the 1871 Trinity group photo, while the older lady shares some resemblance to my grandfather. Is it Reverend Adam and his wife Jane? We have no concrete proof until we have a photograph that we know is of him, but it hints that perhaps in a box in an attic somewhere in Scotland or in Canada hides some of what we seek. With time and persistence, we will continue the search as our labor of love. I hope all our readers had a wonderful a joyous Christmas. With Hogmanay right around the corner, there is much to look forward to in 2010. Currently, the family tree is being updated, and a version that covers some of the other families of the area is in work. We hope to expand the number of lines we have published to hopefully include some of the Gunns, a few Sutherlands, and possibly the Bethunes. Meanwhile, I am trying to put together an expedition back to Caithness for the summer or spring of 2010. I would very much like to re-visit Knockfin, Rhian and finally pin down which of the abandoned houses in Ramscraigs belong to which family. Part of the work to make any possible trip as productive as possible is finding out as much about the areas as I can. During the Landward filming, I was presented with a host of new facts, which I have been working to incorporate into the history. 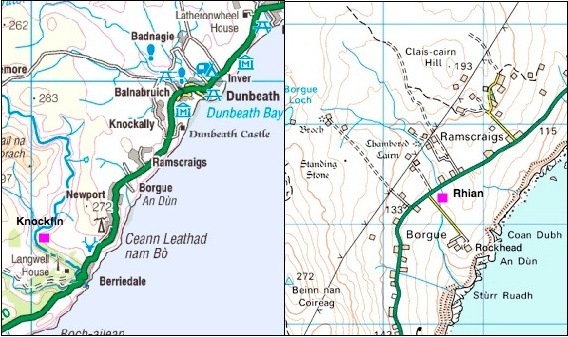 One effort of research is using aerial images in both the visible and infra-red bands to try and better establish where the buildings were, and where features of the terrain were located, such as the old road (which pre-dates the path of the A9), the village of Ramscraigs, the buildings at Knockfin and Rhian, and the site where they landed Herring at the beach below Ramscraigs. It has been a struggle to come up with the data, as most of the companies that might have it seem none too eager for business. It may be necessary to collect it myself during my trip. I am far from an expert and doing so, but I am not without some skill in the area. Any expedition would (hopefully) include documenting the places and stories of the area, in photos, on video and recording the people, that we hope to share with you. During the time when James Henderson and his family lived at Rhian (1799 – 1840), the two primary forces in southern Caithness was the fishing industry and the clearances. Where the clearances was pushing families out of their highland farms towards the coast, the money that could be made at fishing was pulling young men and abled bodied folk down to the coast to earn a steady wage. At Rhian, the family likely lived in a traditional highland blockhouse, or taigh dubh. Blackhouses were so named because of the central peat fire that would eventually cover the interior walls with a layer of black soot. They were typically built with double wall dry-stone walls, with a layer of earth or sod at the top of the walls to bring them to full height, and to seat the wooden crucks. The house only had one door, though which both people and animals would enter the house, with the animals on the byre and and the people on the other, with a sail-cloth separating the two sides of the house. There is a peat fire in the middle of the human end of the house, smoke being left to curl up towards a hole in the thatch. Cooking was done via pots that would hang from the rafters over the peat fire, or a flat iron griddle to cook bannocks. The thatched roof was supported by rafters made of wood held together with wooden pins. The rafters were not laid on the wall head, but were notched into cavities built into the stacked stone walls. The rafters were curved, giving the entire roof a slightly domed effect. These rafters were then thatched with layers of straw, sod and rushes held down with rope and when possible wire netting. The inner walls were plastered with a mixture of lime and sand, while the outer walls were sealed with the same mixture. The house exteriors were pained white when possible. In many houses the central kitchen / family room held a traditional pit hearth capable of holding a week or more of ashes from the peat fire. Peat was abundant in Caithness, and most houses had a good sized “peat stack” that would provide heat and cooking through the colder months. 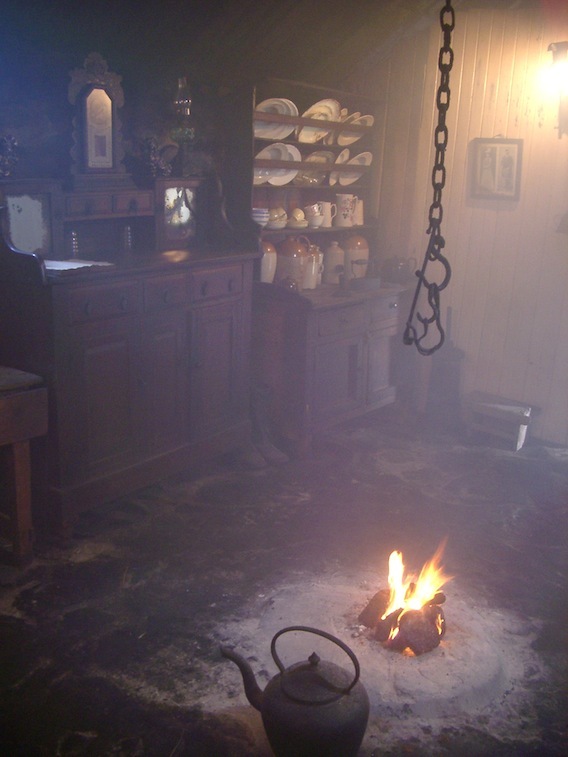 The peat fire was essential to the home, and was rarely, if ever extinguished (it was considered bad luck). Here in the kitchen/living room apartment the fire rested against the gable, the smoke simply curling up the wall and through a hole in the roof. Economics of the farm at Rhian was based more or less on living from the land. The diet was largely of oatmeal, potatoes, mutton, pork, milk, cheese, crowdie, eggs, and hares of which there was an abundance, augmented with salt herring and other fish that was available in increasing supply from the fishing. 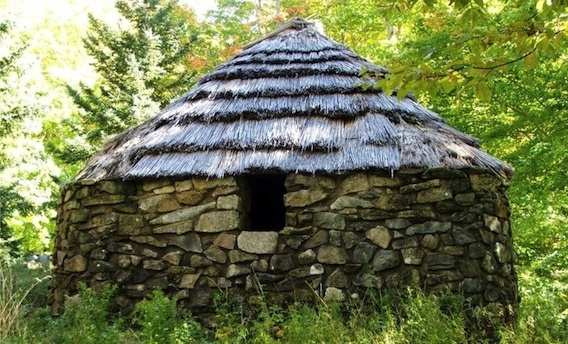 The cow or cattle were often under the same roof as the humans during the winter. This was for the sake of the animal – it was essential to the family that the cow was in good health and gave a good yield of milk. The cow benefited from the warmth of the fire but also gave out large quantities of heat itself, from its body and manure. The byre was at the lower end of the house so that the urine would drain into the arable land. The ammonia from the urine also helped to sterilize the house. Each spring the byre would be cleaned out of the accumulated manure which would be placed on the crops as fertilizer. Human waste would also be gathered for this purpose with the urine being used for treating fabrics such as tweed. The cattle they reared were of the Highland type, horned and shaggy, and their horses were the Highland garron. Rhian had a pair of working horses for ploughing and tilling the soil. The Henderson croft likely kept about twenty four to thirty cattle, while on the hill pasture they had perhaps forty to fifty Cheviot ewes. In all tasks, the family would have enlisted every soul, from the feeding of livestock to the cleaning of the Byre, the two parents and seven children would have been busy nearly every waking hour. School was attended in Berriedale, in a simple one-room school house where the children received a rudimentary education. The Sunday sabbath was strictly observed, and young and old alike were expected to study the word of the Lord well. William, Angus and John showed a great deal of interest in the croft, and as they grew older took on an increasing amount of work at Rhian, and saved what money the could earn for the day when they would have a farm of their own. The family livestock required constant and daily attention. In summer months, the older boys were given the responsibility of taking the herds higher in the hills to the lush seasonal pastures there. Cattle were milked, and that milk crafted into butter and cheese as a means of storing it for the winter. With the long summer days, the summer grazings required nearly around-the-clock supervision of the herds. While in the highland pastures, the boys would sleep in small, rough structures known as Sheilings. The herds would be driven back down to the coast a few weeks before the grain was brought in, allowing the boys to attend classes, church and help gather harvest. Donald was frequently nearby with his uncle, John Sutherland. John had a workshop on his croft where he made and repaired boots and shoes. Donald showed a keen interest in things mechanical and working with tools, and John was all too happy to have willing hands to help. Donald eventually formally became John’s apprentice and devoted himself to becoming a shoemaker, a trade that would eventually become pivotal to his family and his descendants. Younger sons Robert and Alexander heard the call of the sea, and gravitated towards the Berriedale harbor, helping land the catch when the fleet was in, or helping the boats in any way a young man could. In Caithness of that age, fishing for Herring and Salmon was a solid and growing business. With limited tillable land, and eldest sons William and Angus focused on farming, fishing was the best path for a young man to make his way in the world. The episode has aired now (November 27th in Scotland) and thankfully I was able to find a way to see it, and I would now like to share my comments on the episode with you. First off, I think it was great! It’s by far the best 6 minutes of Henderson ancient history on television thus far. Most of the folks in the family who saw it wish it would have been longer, which is understandable. But the pacing, the camera work and way they packed that much information into 6 minutes was fantastic. Word from Landward is that they will provide us with the whole footage some time this spring. I am not sure if it will be possible, but I would very much like to try and put together a “directors cut” of the segment from the portion that aired along with some other elements from the tape. In what I hope can be a reoccurring series, I am happy to introduce you to one of the Henderson ancestors. The distinguished lady pictures is Catherine Henderson. The photograph comes courtesy of Cousin Sally Crossley, one of her descendants. 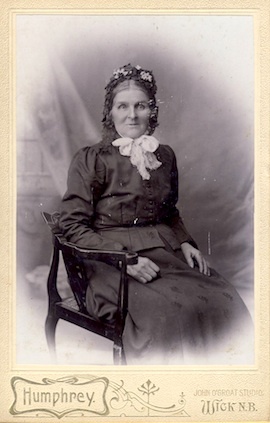 Catherine was the youngest daughter born in 1832 to Angus Henderson (born 24 Apr 1802, son of James of Rhian) and his wife Catherine Gunn (born about 1800 in the Dunbeath area). This family is believed to have lived at a croft in an area called Balnabruich (see map here for where that is) close to the town of Dunbeath. She married a man named George Barnie (born 1818 in Ramscraigs) who worked as a farm hand on the Dunbeath Estate (more on the Barnies later) on 15 February 1856 and settled in the Ramscraigs area. During this period, the Herring boom was nearing a crest, and the town of Dunbeath was a bustling hub of industry. All facets of life were tied to the growing fishing industry, and the swell of commerce it brought to Dunbeath men and women seeking work, and there is some evidence that George may have worked for a time with Donald Henderson making shoes at his shop at Ramscraigs. In the 1861, George Barnie listed his profession as a Fisherman in the Scottish census. George and Catherine had 9 children. and lived to a ripe old age of 96, dying in 1914. First off, it was great fun to do a segment on Landward, and I am forever grateful for the chance to present a portion of our story. Thanks to Holly for going with the idea which originally was to film at Badbea and transition to Knockfin instead. Holly kept things moving forward, and Colin; thanks for lugging that camera all over the place. Simply put, without the good work of the Dunbeath Heritage Centre, none of this could have ever happened. The Centre served as a hub for the shoot, and put forth an enormous amount of research and logistical support. For those that are wondering, a visit to the Dunbeath Centre is worth the drive to Caithness all on its own. With Dunbeath being a rich site of archeology and historical research, the centre’s collection will hopefully continue to grow. Anson is one of the nicest fellows you could ever hope to meet, and I can’t thank him enough for taking us back to Knockfin. My only regret is that I did not have as much time as I wanted to capture the beauty of this place in pictures, but the Estate and Anson has kindly offered to take me back there when I can return to Caithness. This whole thing really started with Lynn and Martin Craig. The original concept that came from Lynn and Holly was to return someone to Badbea in conjunction with Scotland’s 2009 Homecoming celebrations. Over time the idea morphed into the Knockfin plan instead, largely due to who was available to travel to Caithness (me). The Craig’s work to preserve the important legacy of Badbea continues to this day, with their fantastic web site, The Badbea Families. To all of you who put forth the effort to make this happen, my eternal thanks. I am sure I have forgotten someone, so please consider yourself thanked if I overlooked you, and drop me an email. Missing Families - Where Did They Go? By 1810, there is no further record of either William or Angus Henderson in and around the villages of Berriedale or Dunbeath. No record of their death is transcribed in the parish records, and there is no further appearance in any official documents, including the first census of Scotland in 1841. This begs the question – where did these men and their families go? There are several intriguing possibilities. As was cited earlier, the Red River colonies of Manitoba were a frequent destination for Caithness colonists seeking a new opportunity. Is it possible the Angus or William sailed to Canada to join Lord Selkirk’s settlement, and found a way to survive the brutal Canadian winters, and the hostile living conditions. Sadly the records of the early colonies that would become Winnepeg are not accurate enough to provide us with a list of names and places of origin to determine this. There is some evidence that some young men from this region were transported to Australia either by choice or being sentenced to “Transportation” for even minor infractions. One such example is the case of Donald Henderson who lived in Dunbeath at this time. It is not known if Donald was in any way related to our Hendersons, but he provides a narrative of what may have happened to William and or Angus. One summer’s night, the fishing fleet had come in from a successful day catching Herring, and many of the crew were enjoying the services of the inn near the harbor in Dunbeath. Reports say that nearly 50 men were at the inn, mostly from Dunbeath and Berriedale, with a few visiting boats from the village of Helmedale further to the south. As the night wore on, many of the men had quite a bit to drink, and there was a general rowdy drunkenness in the air. Towards midnight, the inn keeper (who was also a Henderson), directed the most drunken of the bunch to leave the inn and head towards their beds. While walking away, several of the men from Dunbeath and Helmsdale stopped on the bridge over the Dunbeath river, where a series of boasts were made between crews, each claiming to be the strongest, bravest and toughest from their village. It did not take long before the boasts turned to action, with the fishermen lifting one another up and tossing men from the bridge into the icy river below. At first this was good natured, but devolved into a fierce contests between the men of Dunbeath and the men of Helmsdale. This would probably be the end of it, had not some travelers, not connected to the proceedings, happened to cross the bridge, and found themselves tossed into the river below. One of these men proceeded to the inn, where the local sheriff (who was also the innkeeper) was alerted. With several of his staff, the innkeeper went to the bridge to “break it up” and found himself mobbed by the drunken sailors. When things were finally settled, several men, including this Donald Henderson, were in irons. Later that month in court, he and his fellow ruffians were sentenced to 10 years “transportation” for their role in the disturbance, and were in essence exiled to Australia. This begs the question – where did these men and what family they had go? There are several intriguing possibilities. As was cited earlier, the Red River colonies of Manitoba were a frequent destination for Caithness colonists seeking a new opportunity. Is it possible the Angus or William sailed to Canada to join Lord Selkirk’s settlement, and found a way to survive the brutal Canadian winters, and the hostile living conditions. Chances are, there are members of the family in North America or Austrailia to this day. Hopefully one day they will find this site and thereby gain the means to re-connect with their past. No discussion of Henderson pre-history would be complete without mention of DNA testing of Henderson Y chromosomes, and what it tells us about history. In 2009, a detailed genetic sequence of a Henderson Y chromosome was performed (67 markers) and it gave the first indications of a Norse, rather than Scottish deep ancestry. The DNA sequence showed that the Y chromosome has a very strong Norse origin, with likely origin in Norway, Sweeden or Iceland. It falls into the genetic designation of “I1d”, also known as I1 “Ultra Norse”. This norse heritage, and the unusual nature of the chromosome sequence (even within the I1d databases) means that finding a similar expression will strongly imply a shared heritage. By the historical account of the genesis of the Hendersons of Caithness, this Y chromosome should be very close to the Gunn Y chromosome, and this is where the mysteries start. The Gunns have been working on a catalog of their Y DNA for some time. In fact they have a robust variety of tests results. Nearly every Gunn man tested comes back with a DNA sequence that falls into two very similar groups. These DNA sequences show broad european origin, or the “R1b” designator (as opposed to Henderson I1). Across northern Europe as a whole, the “R” genes account for 80% of the population, and the “I” genes account for 18%. Of the 3 dozen or so Gunns tested, there is a very predictable pattern, none of which are even close to the Henderson I1d. The Gunns that had been tested were mostly families that had been in the USA for several generations, and had cloudy concepts of their connection to Caithness. This called into doubt (in the researcher’s mind anyhow) how much stock to put in their DNAs relevance. As luck would have it, we found and befriended a fellow (David Gunn) who has not only a direct and recorded link to Caithness, his family lived in the Ramscraigs area. He kindly agreed to be tested, and after a few weeks of waiting, the results came in with a strong R1b type, aligned with the main European male line. That means the results show no Y chromosome similarity between him and the Henderson DNA tested. In fact, he is a strong match for the main body of the Gunn male line, which is likely to re-construct the lines of a few of the Gunn families cleared from the Strath of Kildonan, which will be significant progress in the Gunn project. 1: Family Plan – History as cited may be correct but incomplete. When Henry Gunn left his family to form the Hendersons, he likely took his sons and daughters with him. This means that it is possible that his daughter’s families also took the name Henderson, thus giving us a surname that is not genetically connected to the Gunn line. 2: Friends Plan – When Henry formed his new family, some of the retainers of the Gunn family went with him, and took the Henderson name. This would mean there were multiple male blood lines at the formation of the Henderson of that area. 3: 6th House: There are 5 documented cases of the emergence of the surname “Henderson” across Scotland when last names came into fashion in the middle ages. It is possible that our ancestors came to use this name on their own because of some progenitor named Henry. 4: The Lost Line: This is the biggest wild card in the deck. As history would have it, the chief’s line in the Gunn family died out, to such an extent that the Gunns did not have a chief until one was appointed (for some reason) in the last 100 years. It is theoretically possible that the Hendersons of Berriedale and Dunbeath do carry Henry Gunn’s Y chromosome, which is the same as George the Crowner of Caithness. The Gunn progenitors were referred to in history as the “Ultimate Vikings” and were from the same region that our “I1d – Ultra Norse” is found. As DNA Genealogy is still an emerging field, more test results will help us (eventually) unravel this mystery. Knockfin – a small village on a bend in the Berriedale River that was the home of the our Henderson family prior to the second Berriedale clearance. It has several houses, a barn and even a corn drying kiln. A fairly prosperous settlement. 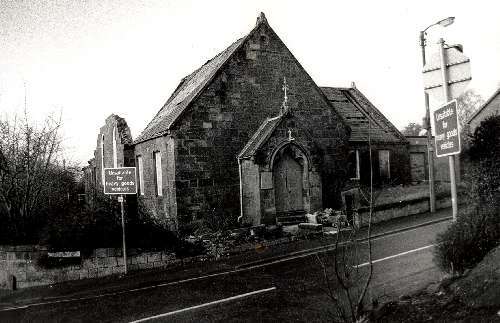 Ramscraigs is now a sparsely populated area of Southern Caithness, but at one time as a thriving village that had its own schoolhouse and church. Before the modern A9 road was laid down, the old road took a different course, and early maps show a cluster of buildings (shops?) at Ramscraigs. The area depicted in these maps (which I hope to post in the future) now are simply fields of sheep. One of the items that appears in the upcoming landward episode is a 20 foot long scroll of paper that displays the family tree as we know it as of June 2009. Several of the cousins have asked what software was used to produce it, and I am sorry to report that it was produced by hand on a Mac using a drawing / drafting package named OmniGraffle. While I had tried many other applications, and they all have their strengths, I found that none of them could produce the diagram I had in my head. In order to produce the document that appears on television, this diagram is then printed on an engineering plotter, similar to printing blueprints for a house or construction project. For those of you who wish a closer look, the Adobe PDF version is now posted to this web site under the new “Resources” section on the right. If you open it, be warned that you will need to scroll around to see it. Going forward I will stage documents, audio files, video files and other foundation reference material here for easy access. I have been known to print copies off from time to time, with cousins getting strange cardboard tubes in the mail. This document is already in need of revision, given what was learned in the last expedition to Caithness, so with luck there will be a new version before the first of the year. The story of how the Henderson saga became part of an episode of BBC Scotland’s program “Landward” is now online. The episode with the Dunbeath footage airs Friday November 27th at 7:00 PM on BBC2 Scotland. Those able to use the BBC iPlayer can view the episode online. As we were tracing our family tree back in time, the oldest record we could find was the birth record for James Henderson, who lived in Rhian. James was born to a man named William, in a place called “Knockfin Berriedale”. This posed a mystery for us, as the name Knockfin had not been used in Caithness or much of anywhere in a very long time (it would turn out for over 200 years). Using current maps, there was one place in Caithness that used the name Knockfin, a remote location up in the hills east of the Strath of Kildonan, typically used as summer pasture for the herds. While I have not had the joy of hiking up there yet, I have used some imagery from Google Earth and others to spot the ruins of some structures there, but something did not quite add up. 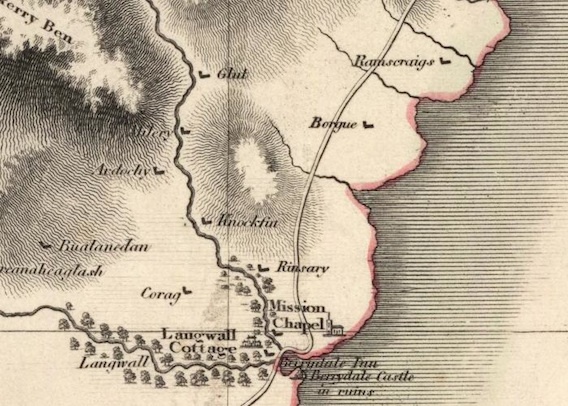 Immediately the thrill of discovery was upon me – here was an old map that recorded the name of Knockfin, not dozens of miles from Berriedale, but located on the river. Fortunately, Google Earth had recently improved the quality of their satellite imagery over Caithness, so I went looking for any signs of habitation, and there it was!